I recently found myself in need of a good medium router to work along my other ones (3-1/2 and 2-1/2 horsepower). I wanted a little unit that will mainly be put towards rounding bits over and doing some hand work. After searching quite a bit for a good router, I am actually satisfied with the PORTER-CABLE 690LR 11-Amp Fixed-Base Router. For my needs, I find that the PORTER-CABLE 690LR 11-Amp Fixed-Base Router is a pretty good choice. Now, keep in mind that this is not my only router…I have some other, more powerful ones. The 1-3/4 horsepower is enough for the applications I have in mind. This single-speed motor has an increased level of precision and will also allow for a maximum of 27,500 rotations/ minute, another thing I like, though, I do wish they will improve the model and enable a variable speed option. 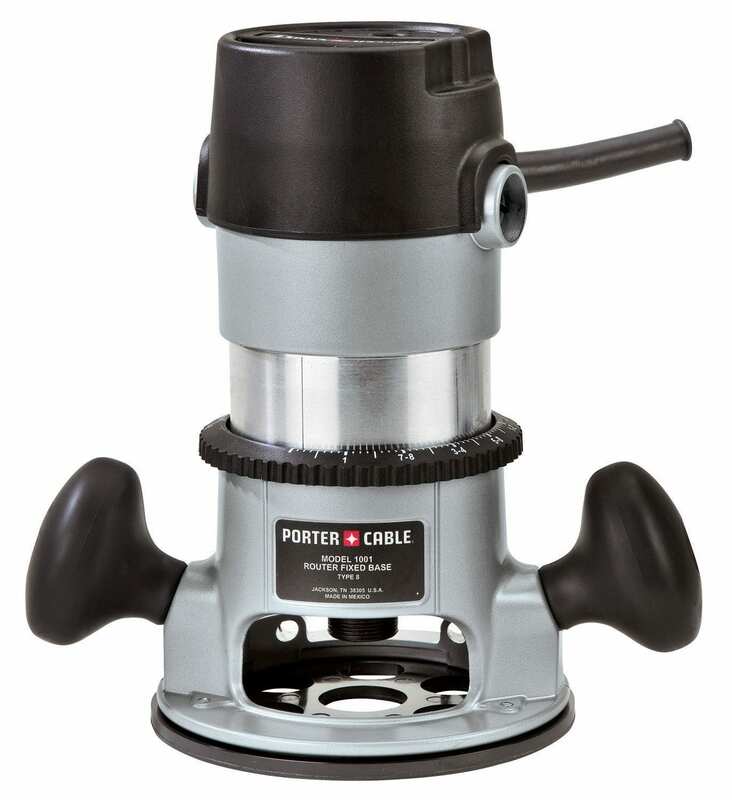 I recommend the PORTER-CABLE 690LR 11-Amp Fixed-Base Router to both professionals and occasional users. It has more than enough RPM to handle about every type of bits. Keep in mind though (beginners mostly) that is best to skip the cheap bits and opt for the hard carbide one when tackling very dense, hard wood varieties. Professionals will probably just use it for rounding up bits and other things along the line, much like I do. It does complement more powerful tools quite nicely. DYI aficionados and occasional users/ beginners will find this unit very easy to use, which is great, considering this might be their only router. Fixed-base or plunge, routers can be of great help in trying to create cut outs in a variety of wood boards, adding decorations or different accents – performances you simply cannot achieve with a regular saw. Fix Base or Plunge Base? If you are a beginner, a fixed-base model is the one for you. While these units limit your control quite a fair bit they are much easier to get accustomed to. Plunge-based units, however, let you apply a certain amount of pressure to push the tool downwards and cut deeper into the wood board. 15 amp motors are the most common on the market. However, if you use them for an extended period at the highest output, the motor will surely burn down. Keep in mind that you should also check the exact horsepower of the unit before purchasing it. This feature will basically tell you how deep the router will go into the wood piece. It’s best you opt for a unit with a variable depth option. One with a lever on the side or an easy to use clamp is the best. The best way to look at this problem is to know the exact number of rotations/ minute. The more the better. A router with a soft start is also recommended, depending on the job at hand. The variable speed option will also allow you to easily get through any potential knobs some wood pieces might have. Unfortunately, this feature is not a universal one. Not all routers on the market have it. The spindle lock will allow you to make quick and easy changes to any setting, as well as swapping out blades. The PORTER-CABLE 690LR 11-Amp Fixed-Base Router is a powerful unit complete with an 11 amps motor that is able to produce 1-3/4 horsepower. This single-speed motor has an increased level of precision and will allow for a maximum of 27,500 rotations/ minute. The high-quality aluminum motor case and base will only lead to a longer life of the entire unit. Adding to the sturdiness of the entire unit’s construction, all components are dust sealed, a good perk in my book. As a bonus, the Cam-lock lever will enable simple coarse height adjustments as well as an easy motor release. The quick fixed-base motor release will allow you to move the motor pack between the plunge and d-handle bases (keep in mind that these pieces are sold separately). The strategically-placed ergonomic handles (2) help in increasing the unit’s portability, leading to a more comfortable routing experience even during all day jobs. As an added plus to the precise cuts the router ensures, no matter the wood variety and density, it also includes some collets that will accept 1/4-inch and 1/2-inch shank bits. The coarse adjustment via spiral cam design and cam-lock lever will always be fast and precise. The collet system is auto-release, allowing for an easy bit removal. This model from Porter Cable is accurate to within 1/128 inch, the optimum precision being ensured by a micro depth adjustor. This model owes its powerful performance to the 11 amps motor being able to produce 1-3/4 horsepower. The unit will be able to handle most, if not all, things you throw its way. The increase level of precision of this single-speed, aluminum-encased motor will allow for a maximum of 27,500 rotations/ minute. The 2 ergonomic, molded handles will increase the level of comfort during use, no matter the job duration. Another perk in this category comes in the form of an under the table stop that helps in preventing the motor from ever rotating under the base. For an increased level of performance and efficiency, this Porter-Cable unit comes equipped with an auto-release colt system that eases the bit removal process. After looking at countless router stats my heart was set on the PORTER-CABLE 690LR 11-Amp Fixed-Base Router. However, as I am not usually the spontaneous type, even with the previous research, I decided to do some more. Did any other people buy this unit? Did they like it? Did they hate it? Yes, I started reading all reviews I could get my hands on, figuratively, of course. After reading a few, I was glad. Most previous users were actually quite pleased with this model and even rated it 5 stars. The powerful motor with 1-3/4 horsepower was deeply praised, as were the deep and clear cuts. Some users also liked the cam-lock lever enabling height adjustments or the unit’s speed allowing a maximum of 27,500 rotations/ minute. Apparently, the 690LR model can hold its own when compared to other models in its class. However, there were some people who had a few issues with this unit, mainly the motor burning out. Now, I do suspect this might have something to do with the router being used for an extended period at the highest output. This is mainly a people issue and not a machine related one. Others have a problem with the fact that the product does not come with a plastic carrying case like it used to in the past. This I understand as an easy to carry case would make a great difference. Though I am pretty set on purchasing the PORTER-CABLE 690LR 11-Amp Fixed-Base Router, here are some other models that landed on my shortlist. This model from Hitachi is my second favorite one, mainly as it both fixed and plunged-Based. Also equipped with an 11 amps motor able to produce up to 2-1/4 horsepower, this unit will be able to handle everything you might throw its way. What makes it my favorite is the fact that it’s incredibly silent making only about 79.5 dB in noise. Its speed control is quite high-performance and easy to use, allowing you to maintain whatever level of speed you need for a particular project at a constant level. Another great perk is the fact that the Hitachi comes equipped with a variety of much-needed accessories. From a centering gauge and some wrenches (16, 23 mm and a 4 mm Hex Bar) to a centering gauge and 2 collet chunks (1/2’’ and ¼’’). Another pretty powerful option is this router from Bosch. Both fixed and plunge-based, this unit comes equipped with a 2-1/4 horsepower producing motor that is able to deliver up to 25,000 RPM. Also coming with some much-needed accessories (collet chunks, chip shield, wrenches, plunge and fixed bases) like the previous Hitachi model, this one is has a very sturdy construction. The high-quality aluminum it’s made of will help the unit in lasting for a very long time, if properly used of course. Much like the porter-Cable one, this model from Dewalt is also only fixed-based. The 11 amps motor it is equipped with is able to produce 1-3/4 horsepower, allowing you to smoothly route through even the hardest of wood varieties. The steel motor cam lock, fully adjustable and tool-free, makes depth adjustment and base changes quickly and solidly locks everything in place. The micro-fine depth adjustment ring will provide precise depth adjustments in 1/64-inch increments, and the included sub-base concentricity gauge will provide the best bit concentricity in the class. Also from Porter-cable we have the 892 model. This unit is equipped with a 12 amps powerful motor that has an incredibly soft start. As a plus, there is a variable speed option that allows you to better optimize bit speed for very specific applications (10,000 – 23,000 rotations/ minute). The dual-position switch will allow you to cut the power while still maintaining ca control over the unit. For a plus of comfort, especially needed in the case extensive use, the over molded grips will ensure you can easily hold the router. Another great feature is the spindle lock that enables single wrench bit changes. All in all, this last unit is also quite a nice choice to keep in mind. All in all, the PORTER-CABLE 690LR 11-Amp Fixed-Base Router is a pretty nice choice, at least for me. I do like the motor and think it’s quite powerful for what I need. Also, the 27,500 RPM are more than enough to handle most things you throw at the unit. While I do wish it had a variable speed option the precision of the cuts and overall high-performance of the unit does tend to make me forget about this aspect. And for those people who complain about the opening on the plate being too small that the collet will definitely hit the plate, you are not using it right. The opening is small, granted, but, you shouldn’t run your router down far enough that collet will hit the plate. You are probably putting the bit too far down in the collet. I do believe this mainly happens to occasional users. I did not have a problem with this fact at all. While not a perfect router by any means, the PORTER-CABLE 690LR 11-Amp Fixed-Base Router is a pretty good choice for many. However, do think about whet your job entitles before making a purchase.